WHOSE HEART IS SET ON PILGRIMAGE"
Anticipating a pilgrimage to the Holy Land? Bible References will help you locate major stories pertinent to the sites you’ll be visiting. After returning from the Holy Land, having studied Scripture “on location,” you will be reading the Bible in color, rather than in black and white. Eager to read up on the Biblical period? The Booklist recommends titles from my library of well-thumbed books on the Holy Land. As a Connecticut-born Yankee transplanted to King David’s court, and a pilgrims’ guide since 1978, I have been studying the Bible, the land, and archeology for nearly three decades. Interested in creative ways of visiting well-known sites, as well as those lesser-known off-the beaten-pathways? Then subscribe to my free quarterly “Holy Sites: Gila's Highlights.” The last highlight was "Let's chill by the city gate at Dan." This month's highlight is "Let's find the temple tax in St Peter's Fish." The next highlight will be "Do the biblical poisonous snakes still exist in the holy land?" profiles of Mary Magdalena, Bathsheba, Elizabeth, Abishag, the Witch of En Dor and Veronica (who is actually not biblical!). Like to read profiles of notorious celebrities or biographies of alpha achievers? Holy Land Headliners profiles personalities who have left their mark on the Holy Land, including a femme fatale eyeing Jericho, a bishop lost in the Wilderness of the Temptation, a Connecticut Yankee who audaciously tackles Biblical geography and a former terrorist who wins a Nobel Prize for peace. The "Slingshot that killed Goliath" is the best selling item in Gila’s Gift Shop, which also offers CDs of Israeli folk music, books on daily life during biblical days and the up-to-date Gila's Guide: Explore Jerusalem's Soul. Tips for Tours gives you fun and practical ideas culled from collaboration with hundreds of ministers, priests, rabbis, teachers, professors, and facilitators I have team-guided with over the years. 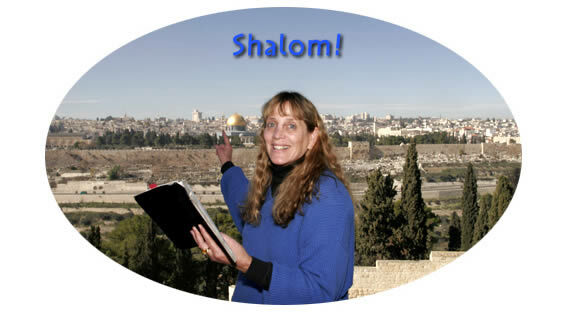 If you are considering leading a Holy Land Tour, then you may want to check out "A to Z for Holy Land Tour Leaders." Songs & Praise provides transliterated words for the Hebrew songs I teach on bus rides and the blessing we recite upon seeing Jerusalem for the first time. About Gila is an interview with yours truly, answering questions asked, time and again, usually on that first drive from the Ben-Gurion Airport. Have fun exploring these Holy Land resources and contact me if if you’d like to book me as your holy land guide.